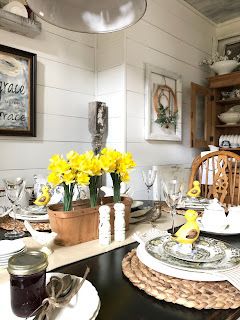 This Easter Tablescape was created using yard sale and thrift store items. No single item on the table was more than $10.00. Many items I've had and collected over the years. I also, find a lot of great deals online and they are delivered right to my door. See some of my favorite finds here. If you don't have a large collection to pull from, begin to keep your eye open and visit thrift stores and consignment shops for some of the best deals. If you like a vintage look, there are some great reproductions available through online retailer's such as Bits of Vintage and Decor Steals. 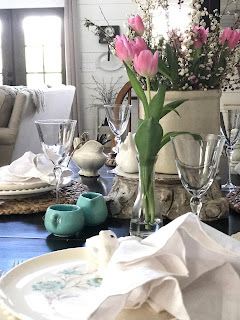 I love pulling out my dishes and stemware to create seasonal tablescapes. 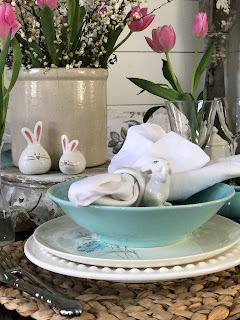 This year I found these cute little bunny napkin rings for $2.50 at a thrift store. I knew they were the perfect inspiration for this tablescape. 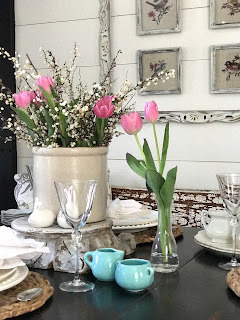 I filled a small crock with early blooming wild flowers and some fresh tulips. I have also found some great deals on faux tulips that look very real. Link here. The sweet bunny salt and pepper shakers are a previous find at TJ Maxx. When I see something that makes me smile, I know I'll love using it in my decor choices over the years. Many items I've collected over the years. The vintage dishes were a yard sale find, many years ago. I use these dishes all the time. I love the little whimsical flower detail. The stemware was a Dollar Tree purchase several years ago and although they were only $1.00 each, they are my favorite stemware. I have found some great items at the Dollar Tree. The cream and sugar bowl are from a thrift store. The crock and the bud vases are also thrift store finds. First, find something that inspires you to set the table. 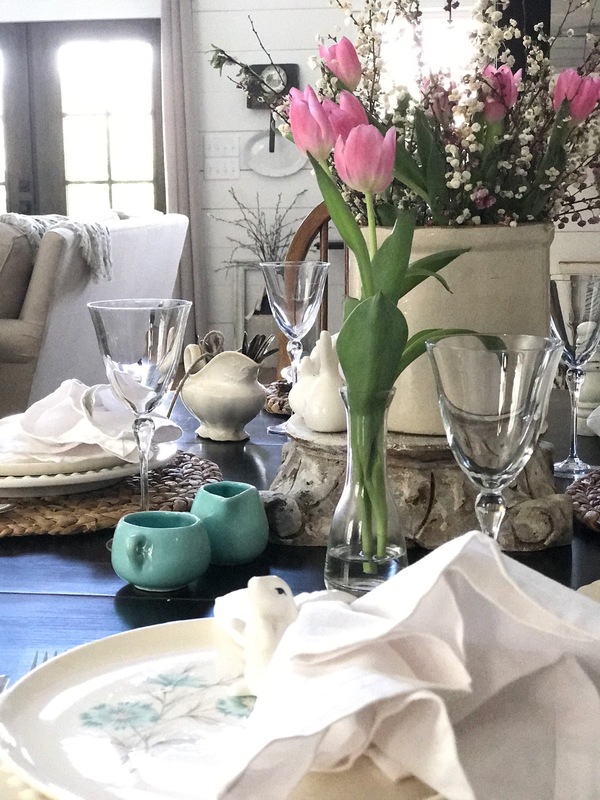 Then pull out items from your existing supply of dishes, stemware, napkins, etc. If you don't have a complete set, look for mix and match dishes. I love to mix and match my dishes as well. 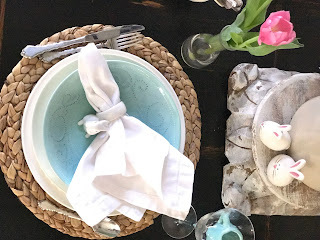 Pick up additional items at stores like the Dollar Tree, TJ Maxx, Bits of Vintage, Decor Steals, or shop some of my favorites here. You don't have to spend a lot of money to make your table look like a million. Here is this table set for a small ladies night out. When there are to many guest to be seated at the table, I just pile the table full and everyone grabs a plate and we sit at various places around the house or on the porch. 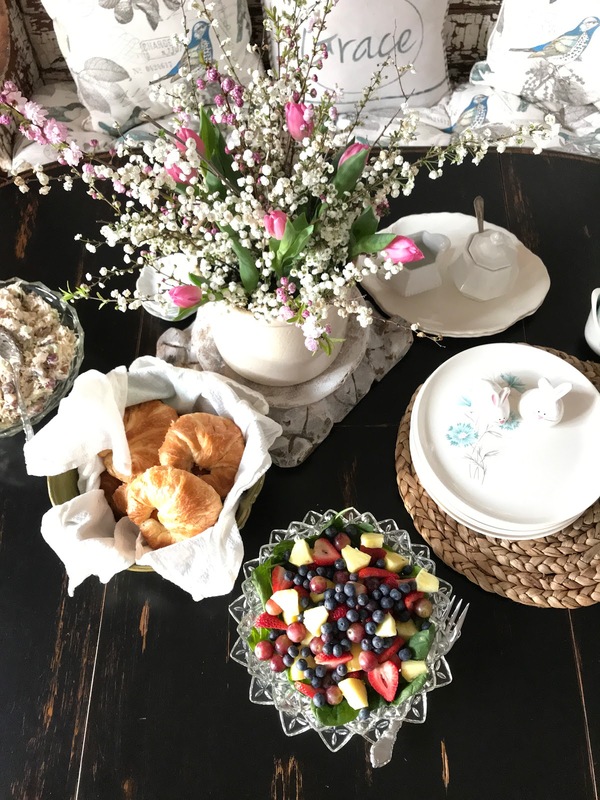 I love using my vintage pieces when I entertain. I prefer my husbands grandmother's crystal dishes to something I can purchase new. I like using items that are unique and one of a kind. 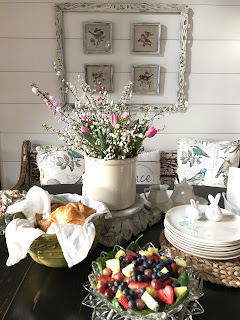 When styling this table, I used items that were needed and other's just to create interest. The stack of butter pat's and the ironstone cream and sugar bowls are just filler's. 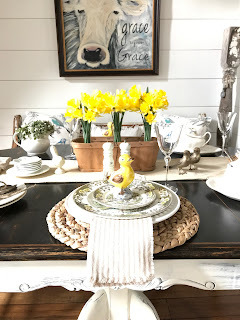 As soon as the first daffodil bloomed and I saw this cute little chick at Vintage Cottage, I starting pulling out my vintage dishes. This time I decided to use a table runner. This is actually just a length of fabric that I use to cover the table on occasion. I just folded it to the width I desired and ran it down the center of the table. The chargers cover the ends of the fabric. 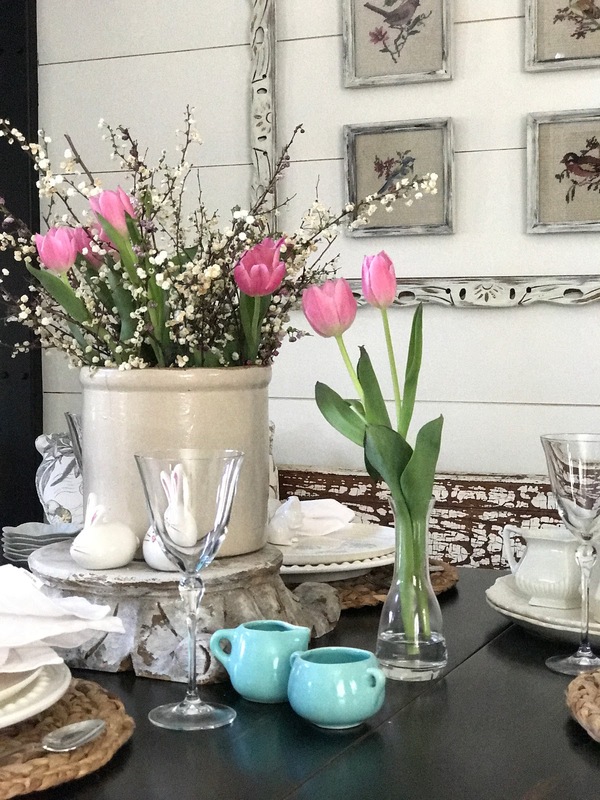 I pulled out my ironstone pieces, vintage dishes, Dollar Tree stemware and ta da! The Home Sweet Farmhouse Pillow is one of my original designs and here is a link for a closer look. The berry crate and wooden salt and pepper shakers are thrift store finds. I just added a little Old White Chalk Paint to the shakers. If you like to shop online, you can link above to Shop My Favorites or check out Bits of Vintage for some great reproductions. The napkins are some of my design work. The are made from ticking fabric and have Dine, Eat, Drink on them. For a closer look, link here. I hope some of these tablescapes will inspire you to use items that you have in your decor. Search for things that you love when shopping and thrifting. It all started with flowers.